Spoke 59 is out Monday! The wait is over! 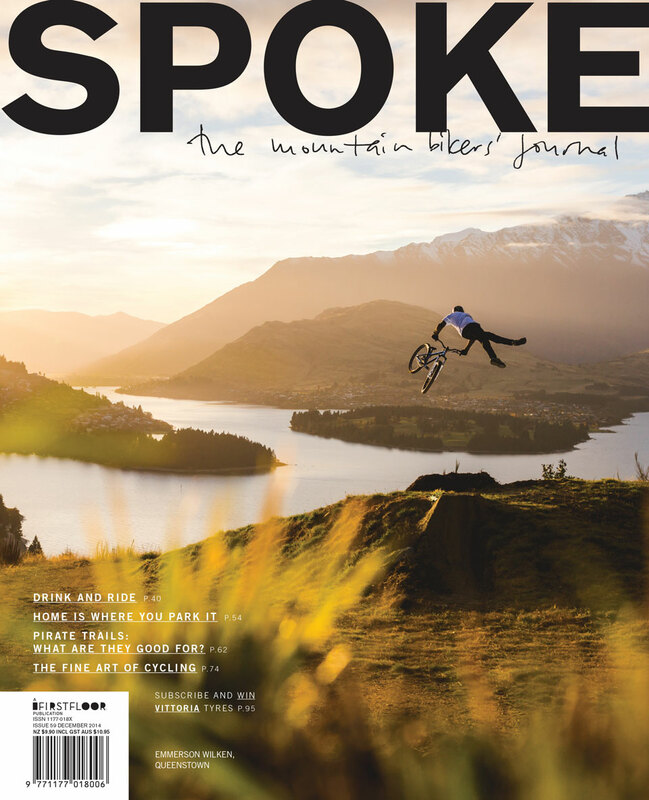 Yes, Spoke 59 is here with 96 pages of visual and cerebral stimulation. From the stunning cover shot of Emmerson Wilken floating high above a typically epic Queenstown sunset to the mindful musings of the Last Roll, there’s plenty going on between the bindings to fluff what’s between your ears. The annual migration of Kiwi riders to the European World Cup circuit continues to grow every year, and Kate Fluker and Reon Boe are keeping the tradition alive as they tackle the XC and DH circuits in their big yellow van. We get the lowdown on their sometimes gritty existence from Anka Martin with hubby Sven on photo duties. If you’ve never heard of Chris McNally, you’re probably not alone, but you more than likely have seen some of his illustration work gracing the mountain bike media in adverts, clothing, posters or stories. His background and journey are as interesting as his unique line drawings and use of colour. When you think of riding in Canada you probably think of Whistler and other BC hotspots, but maybe the name Newfoundland should be included in any plans to ride in the great north. If Colin’s words and Mattias’ photos don’t get you stoked, check your pulse. Ever wondered where that trail you ride every week came from? Maybe it started out as just a walking track, or was built by mountain bikers who didn’t exactly play it by the book. These ‘pirates’ have been building since the dawn of time, and continue to do so. Are they helping the sport or doing more harm than good? Laura Williamson digs deeper and gets the dirty facts. Beer. Trails. They go together like, well, beer and trails. Our resident tipplers spent a day on some Wellington icons and matched the best brews to complement them. There’s heaps of other great reading, like Ground Effect’s 20th anniversary celebrations (also involves beer), profiles on some of the industry’s biggest hitters, what real old bikes look like when brought back to life, plus tasty bars, bumbags, bikes, bits and Bardsley in a skinsuit. That’s worth the cover price alone! Get Spoke 59 on the newsstands Monday, on Zinio and in the webshop now.